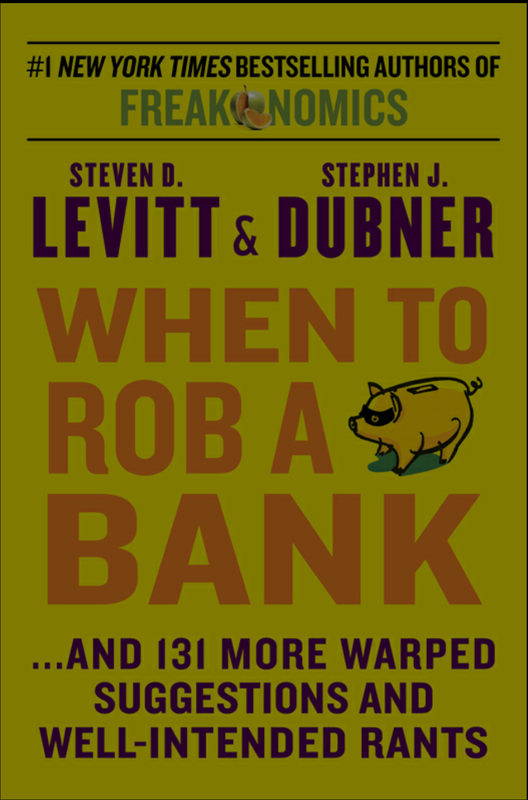 Written by the Freakonomics authors, When to Rob a Bank…And 131 More Warped Suggestions and Well-Intended Rants is a compilation of their blogs posts. For those unfamiliar with Freakonomics, Levitt and Dubner are respectively, an economist and journalist who apply economic theory to nontraditional topics. For example, in the book the authors conclude the best way to reduce New York area airport delays and congestion is to shut down LaGuardia Airport. Though the idea seems counterintuitive, the authors make a good argument for their case. Not just about airport congestion, When to Rob a Bank… contains many more interesting theories and their corroborating evidence. What I like about When to Rob a Bank… is the authors’ willingness to take-on controversial topics and their unique perspective. In fact, their first topic is that it’s much more economically advantageous to read their blog rather than buy this book. So, if you’re looking for an irreverent read, When to Rob a Bank… is the book (or blog [freakonimics.com]) for you! By the way, there is no good time to rob a bank because the yield is too small ($4,120) with a 35% arrest rate. According to the authors, if one wants to steal from a bank, work at one and embezzle from it!